I've always thought that flying cars were similar to videophones; people have been demoing them since the middle of last century, but they never really managed to catch on. Then I realize I use a videophone all the time on my computer, and all of a sudden flying cars don't seem so impossible. Especially with new designs like the Dutch Pal-V which just completed its first flight tests. 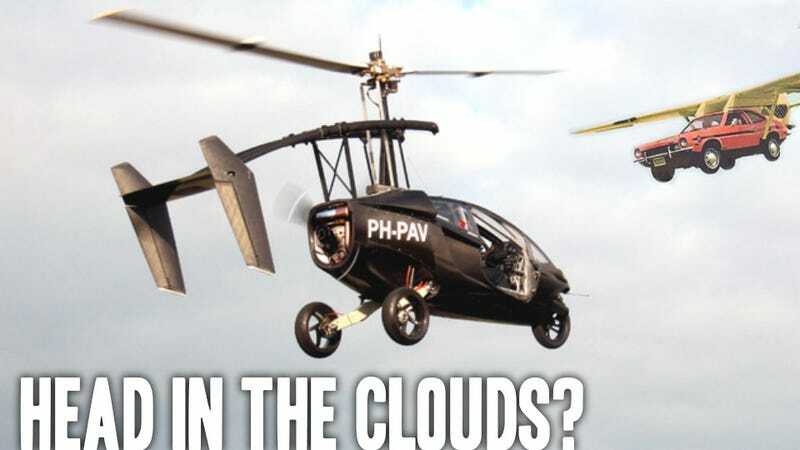 This isn't the flying Pinto you imagined your father flyving (a term I just coined for flying/driving which we'll need when we all have these things)– where most flying car attempts have focused on fixed-wing aricraft, the Pal-V transforms between car and autogyro. An autogyro uses an unpowered helicopter-like upper rotor to generate lift instead of fixed wings. It has short take-off and landing lengths and, if you lose engine power, can make a gradual, controlled decent since the main rotor isn't powered, anyway. The Pal-V on the road resembles the Mercedes-Benz F300 Life Jet concept from the late 90s: a small, narrow-bodied, tandem-seating little wasp that leans into turns. Unlike many previous flying car attempts, there's no clumsy wing assembly to leave at an airport or tow behind you– the upper rotor assembly simply folds behind the car, and the rear tail unit collapses in, including a really great looking folding propeller system. While there's no doubt this is impressive, and the technology certainly seems well thought-out, it's hard not to feel we've been down this road (or sky) before. Flying cars seem to get to this point, then the actual thought of lots of people flying these around, the same people you normally see driving, seems to cool all these efforts down. The Pal-V specifies flight ceilings below commercial air travel (so no fun pranks, like the hilarious inflatable-gremlin-on-the-wing), and the safe-unpowered may help make a difference here. I'm hoping, but probably won't do much breath-holding.